Michigan City's Ames Field in Northwest Indiana will once again host the Open Class World Championship in its entirety over two days of competition. 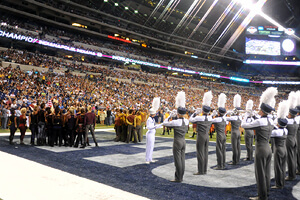 All World and Open Class corps will go head-to-head starting with the World Championship Prelims at Lucas Oil Stadium. 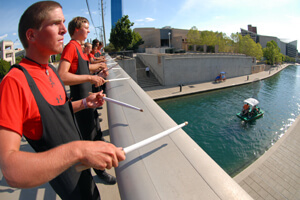 The Open Class Individual & Ensemble Competition will take place on Wednesday at the Indiana Convention Center. The Celebrate Indy Arts! 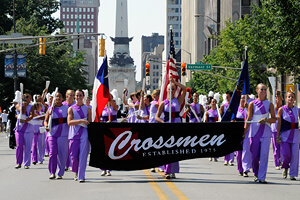 Parade on Saturday morning will feature all non-finalist corps and members of the local Indianapolis arts community. An en masse finale of all participating corps will take place on the picturesque steps of the Indiana War Memorial immediately following. Working with the Indiana State School Music Association and Indiana Bandmasters Association, DCI will present the "biggest middle school band ever." INpact: Indiana's Future-Band will perform at two large-scale events during World Championships week. The Grand Reunion After-Party — promising to be "the largest drum corps reunion party in history" — will bring together alumni and fans from all over to celebrate 40 years of rich, drum corps history. DCI will host several free educational events for current and future music educators and for students Saturday, Aug. 11 including the Marching Music Academy Sampler and Kick Start Your Season workshops. Eastern time zone unless otherwise noted. Open Class Semifinals Where: Ames Field, 2501 Franklin St./State Route 421, Michigan City When: Gates open 2 p.m. (CT) Admission: $15 general admission About: In its fifth anniversary in Michigan City, the Open Class Semifinals will kick off all 2012 World Championship events. Taking place at Ames Field, an intimate stadium built with drum corps in mind, this event will feature all participating Open Class corps. Buy tickets to this event. View the lineup and performance times for this event. Open Class Finals Where: Ames Field, 2501 Franklin St./State Route 421, Michigan City When: Gates open 5 p.m. (CT) Admission: $25 reserved, $15 general admission About: The DCI World Championships continue on Tuesday, Aug. 7 as the 12 top scoring Open Class corps from the Prelims compete for the title of World Champion. Buy tickets to this event. View the lineup and performance times for this event. Open Class Individual & Ensemble Competition Where: Indiana Convention Center, 100 S. Capitol Ave., Indianapolis When: 2 p.m. Admission: Free and open to the public About: Open Class corps will head to downtown Indianapolis on Wednesday, giving their individuals and small ensembles the chance to shine. View the schedule of I&E performances. Hall of Fame Kickoff Party Where: Historic Union Station Grand Ballroom, 23 W. Louisiana St., Indianapolis When: 9:30 p.m. – 2 a.m. 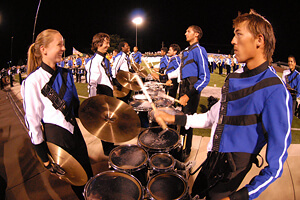 Admission: Access to the ballroom is free and open to the public About: A wildly popular event started in 2009, Drum Corps International hosts its fourth annual Hall of Fame Kickoff celebration to start the 2012 World Championships in Indianapolis off with a bang. Evening festivities include live music, games and auctions, with a special presentation recognizing the DCI Hall of Fame Class of 2012. Proceeds will benefit various Hall of Fame projects, one of which is the Jim Jones Leadership Scholarship, an award administered by a committee of Hall of Fame members. Learn more about the 2012 Hall of Fame inductees. DCI Headquarters Open House Where: 110 W. Washington St., Suite C (Northwest corner of Illinois and Washington Streets, below Panera and Weber Grill) When: 10 a.m. – 5 p.m. Admission: Free and open to the public About: Stop on by and have a chat with Drum Corps International employees while taking a tour through the DCI corporate headquarters in downtown Indianapolis. Be sure to make a stop at the Percussive Arts Society's Rhythm Discovery Center which is located right next door. Corps Warm-Up Zone Where: Military Park, 601 W. New York St., Indianapolis When: Early morning until last performing corps warms up Admission: Free and open to the public About: Come see your favorite corps warming up before their competitive Prelims performances at historic Military Park, a 14-acre green space bordering the campus of IUPUI. Learn more about Military Park. DCI Festival Marketplace Where: Lucas Oil Stadium, 500 S. Capitol Ave., Indianapolis Marketplace Hours: 8 a.m. until stadium clears at the end of the Prelims event Admission: Free with your ticket to the Prelims About: Grab some cool new gear from DCI, your favorite corps and DCI's corporate sponsors! Entertainment, souvenirs, information, and other items and activities will be awaiting. 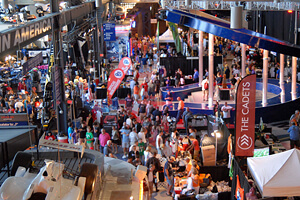 Immediately upon entering Lucas Oil Stadium's east-side entrance, fans will find themselves immersed in the Festival Marketplace with booths lining the concourse leading to the seating area. World Championship Prelims Where: Lucas Oil Stadium, 500 S. Capitol Ave., Indianapolis When: Gates open 10 a.m. Admission: Tickets start at $25 About: Following 2011's twist to the traditional World Championship format, the Prelims competition will feature a veritable "all-skate" of DCI corps. In addition to the performances of all 22 World Class groups, Open Class corps will also be invited to compete at this event. 40 corps are scheduled to go head-to-head in this all-day competition at Lucas Oil Stadium. Buy tickets to this event. View the lineup and performance times for this event. Big, Loud & Live 9 Theater Broadcast Where: More than 600 movie theaters across the U.S. When: 6:30 p.m. ET/3:30 p.m. PT Admission: $18 (may vary by theater location) About: If you can't make it to Lucas Oil Stadium, you can still watch the incredible corps performances. Celebrate the "best of the best" as Drum Corps International presents its 2012 World Championship Prelims on the big screen! Presented by DCI and National Cinemedia's Fathom Events, Big, Loud & Live 9, will be broadcast from Indianapolis' Lucas Oil Stadium bringing you the complete live performances of the top 15 corps and highlights from throughout the day. Learn more and find a theater near you! DCI Headquarters Open House Where: 110 W. Washington St., Suite C (Northwest corner of Illinois and Washington Streets, below Panera and Weber Grill) When: 10 a.m. – 5 p.m. Admission: Free and open to the public About: Stop on by and have a chat with Drum Corps International employees while taking a tour through the DCI corporate headquarters in downtown Indianapolis. Be sure to make a stop at the Percussive Arts Society's Rhythm Discovery Center which is located right next door. Corps Warm-Up Zone Where: Military Park, 601 W. New York St., Indianapolis When: Approx. noon until the last performing corps warms up Admission: Free and open to the public About: Watch your favorite corps warm up before they take the field for the Semifinals competition. Military Park is a little less than a mile from Lucas Oil Stadium. 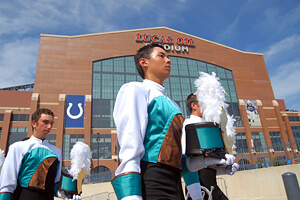 A shuttle bus to and from Lucas Oil Stadium and the Warm-Up Zone will run from 1 p.m. to 10 p.m.
DCI Festival Marketplace Where: Lucas Oil Stadium, 500 S. Capitol Ave., Indianapolis Hours: 12:30 p.m. until stadium clears after the Semifinals event Admission: Free with your ticket to the Semifinals About: Purchase souvenirs and other merchandise from your favorite World and Open Class corps, Drum Corps International and more! The Festival marketplace in 2012 is located throughout the main stadium concourse leading from the stadium's east entrance to the seating areas. World Championship Semifinals Where: Lucas Oil Stadium, 500 S. Capitol Ave., Indianapolis When: Gates open to marketplace 12:30 p.m., First corps steps off 2 p.m. Admission: Tickets start at $25 About: The World Championship Semifinals features the top 25 corps as determined by Thursday's Prelims event. These corps will duke it out for a spot in the coveted "Top 12," giving them one more chance to perform on Saturday. Buy tickets to this event. Age-Out Ceremony & Grand Reunion Festivities Where: Lucas Oil Stadium, 500 S. Capitol Ave., Indianapolis When: Following Semifinals performances Admission: Included as part of Semifinals admission About: While taking a look back at and celebrating its rich 40-year history, Drum Corps International alumni will welcome the graduating class of 2012 – corps members who have dedicated their time, passion and hard work to the drum corps activity over many years in this special ceremony. Grand Reunion After-Party Where: Crane Bay Event Center, 551 Merrill St., Indianapolis When: Following Grand Reunion festivities Admission: Open to the public, tickets are $40 About: The largest drum corps reunion party in history will cap-off the night, bringing together hundreds of drum corps fans and alumni from a variety of corps spanning the 40-year history of DCI. 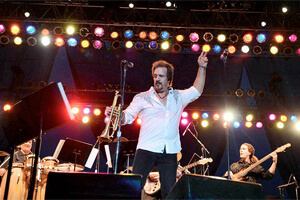 The after-party will feature Late Show trumpet player Al Chez and his band, The Brothers of Funk. Buy tickets to this event. Marching Music Academy Sampler Where: Lucas Oil Stadium, 500 S. Capitol Ave., Indianapolis When: 9 a.m. to 12 noon Admission: Free and open to current and future music educators with a ticket to the Finals About: DCI presents a "sampler" edition of its acclaimed Marching Music Academy, featuring some of the world's most recognized experts in marching music. Learn more about this event. Celebrate Indy Arts! Parade Where: North and Pennsylvania streets, Downtown Indianapolis When: 11 a.m. 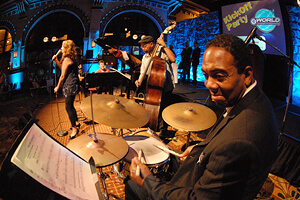 Admission: Free and open to the public About: The Celebrate Indy Arts! Parade will bring all non-finalist corps (both Open and World Class) together with members of the local Indianapolis arts community for the most musical, creative and fun-filled parade to ever hit the streets of the Circle City. Stepping off at 11 a.m., the parade will wind through the streets of downtown Indianapolis. Serving as Grand Marshal of the parade will be former American Idol contestant Shaun Canon. Immediately following the parade, more than 2,000 brass musicians from all of the participating corps will assemble on the Indiana War Memorial Mall (431 N. Meridian St.) to play an en masse rendition of the National Anthem and "Simple Gifts." View the parade route. Kick Start Your Season Leadership Workshop Where: Lucas Oil Stadium, 500 S. Capitol Ave., Indianapolis When: 1 p.m. Admission: Free and open to high school and college students with a ticket to the Finals About: Kick start your season with DCI and motivational speaker Fran Kick. 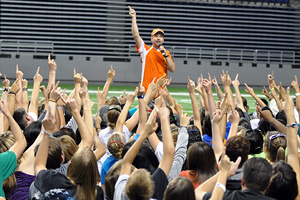 Kick's interactive and engaging leadership presentation will help students learn how they can "Kick It In" this fall marching season. Learn more about "Kick Start." Corps Warm-Up Zone Where: Military Park, 601 W. New York St., Indianapolis When: Approx. 4 p.m. until last performing corps warms up Admission: Free and open to the public About: Watch your favorite corps warm up before they take the field for their final performances of the 2012 season. A shuttle bus for fans will run between Lucas Oil Stadium and Military Park from 5 p.m. to 10 p.m. Lucas Oil Stadium "Backstage" Experience Where: Lucas Oil Stadium (meet Missouri St. Loading Dock on west side of stadium), 500 S. Capitol Ave., Indianapolis When: 3 p.m. Admission: Free with ticket to the World Championship Finals About: Feel the anticipation and excitement through a corps member's eyes right before heading into competition. During this backstage tour of Lucas Oil Stadium, we'll take you from the stadium entrance tunnel right out onto the field. Bring your camera so you can take your photo next to the DCI Founders Trophy! DCI Festival Marketplace Hours: 3:30 p.m. until stadium clears after the Finals event Admission: Free with your ticket to the Finals About: Depending on how many Championship events you'll be attending this week, here's either your first or final opportunity to purchase souvenirs from Drum Corps International, the corps and DCI's corporate sponsors! Pre-show Performances Where: Lucas Oil Stadium, 500 S. Capitol Ave., Indianapolis When: Preceding World Class Finals competition Admission: Free with your ticket to the Finals About: INpact Indiana's Future-Band, the "biggest middle school band ever," will perform "Live for Music" with former American Idol contestant Shaun Canon. 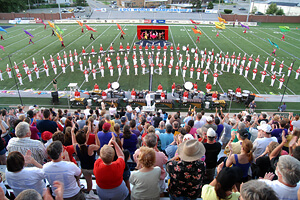 The Commandant's Own, the U.S. Marine Drum & Bugle Corps, will also make their traditional performance at the event. 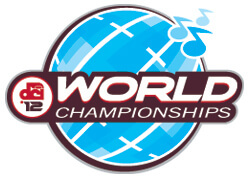 World Championship Finals Where: Lucas Oil Stadium, 500 S. Capitol Ave., Indianapolis When: 3:30 p.m. gates open to Festival Marketplace, Awards Ceremony 10:30 p.m. Admission: Tickets start at $35 About: The Top 12 corps will compete for the last time in 2012 and for the chance to be named Champion. These 12 fantastic corps will put on a show you won't want to miss! Buy tickets to this event. Special events and times subject to change.